: This 120-page book written by a former monk and inventor of the world’s best training tool (The Billiard Aim Trainer BAT), Paul Rodney Turner, provides the essential ingredients of what makes a great billiards player. The chapters are concise and digestible and not filled with unnecessary fluff. The idea behind the book was to give you an easy-to-understand roadmap to success, in the form of short essays describing key elements of the game. One glaring omission from many books on billiards is a lack of information on the mental side of the game, including visualization, and how to practically incorporate proven techniques of visualization and mind management into your game. 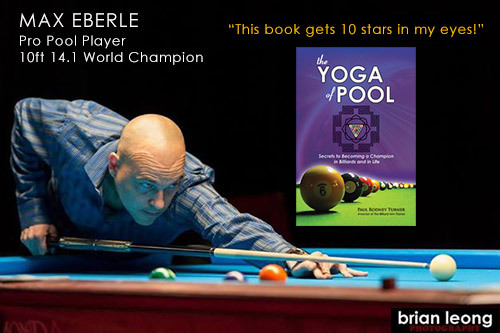 The YOGA of POOL is more than an instructional treatise on the fundamentals of billiards but includes techniques and tools for self-improvement. Drawing from the ancient wisdom of the Vedas, Turner successfully guides the reader in releasing their highest potential as a billiards player and in dealing with the challenges of life. “If you like to read pool books, I have a solid recommendation for you. It’s a short and easy read, and it happens to be one of the best pool books ever written. 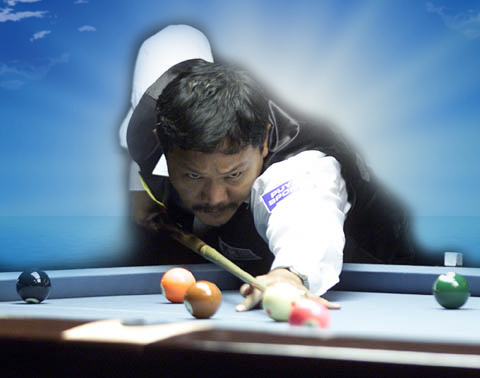 The YOGA of POOL covers all the fundamentals of the game of billiards, including shot routine, the importance of the pause, leg position, confidence-building exercises, will to win, visualization techniques, as well as the most critical – how to aim correctly. In this respect, I introduce the 3-cut system, demystifying it for the rookie and the seasoned player. For example, did you know that a half-ball cut correlates exactly to a 30-degree angle? Indeed it does, so once you train your eyes to see a 30-degree angle on the table, you will absolutely know that the way to pocket a ball with a 30-degree angle is to “Cut the ball in half”, but what does that mean exactly? It means directing the center of your cue ball to the outside edge of the object ball to send it on a 30-degree angle to the pocket. The World’s Best Aiming System for Billiards teaches the legendary 3-cut system of aiming popularized in snooker and used by the greatest billiards players in the world. The book breaks down the essential elements of success that can be easily applied immediately while playing any kind of billiards. The 3-cut system is based on geometry so it is the most reliable and accurate aiming system available. Get this book and start pocketing balls like never before! Your friends will be amazed. If you’re like me, you’ve probably read all the books on how to improve your game, including the classics from Phil Capelle. I don’t propose that this book will cover every facet of the game of billiards; Capelle’s books do a great job of that. However, what I will declare is that The YOGA of POOL – Secrets to becoming a Champion in Billiards and in Life will provide you all the essential tools you need to become a great player, while simultaneously helping to make you a better person. The book provides the fundamental ingredients of what makes a great player. The chapters are concise and digestible and not filled with unnecessary fluff. The idea behind the book is to give you an easy-to-understand roadmap to success in the form of short essays describing key elements of the game. I need to point out that the sections dealing with aiming are taken from my other book, World’s Best Aiming System for Billiards. I felt it was necessary to include the same information for completeness of this book. If you already purchased my other book the World’s Best Aiming System for Billiards, you may skip those sections. In any case, the knowledge contained within this book will certainly expand your understanding of the Three-Cut System and support your development in all other facets of the game. One glaring omission from many books on billiards is a lack of information on the mental and spiritual side of the game, including proven techniques for visualization, mind management, and confidence building exercises. You’ll find them in this book, and rightly so, because to ignore the mind and spirit is akin to ignoring the driver of the vehicle. Every world-class motor racing team knows that a good driver is the difference between success and failure. As the subtitle suggests, this book is much more than the secrets for success in billiards; it is, in a way, a kind of “Covey-like” directive for the billiards enthusiast on what makes one successful in life. You may just come away from reading this book feeling a renewed sense of self-worth and optimism. I hope so. I promise you this: if you apply the following ingredients of success to your game, and in your life, you will experience monumental improvements in every aspect. My hope is that the book will serve to make you the very best player and the best person you can possibly be. Australian-born Paul Rodney Turner (a.k.a. 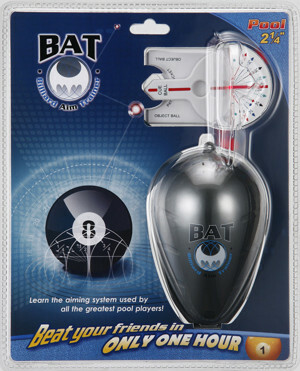 BATman) invented the Billiard Aim Trainer (BAT) in 2004 while contemplating a method to teach his billiard students how to understand and apply the three-cut aiming system he learned as a boy while practicing snooker. Paul started playing pool in 1973 at the age of 10, on a 7-foot particleboard pool table in his family’s garage. Fascinated by the art and geometry of billiards, Paul studied the books of legendary snooker and billiard greats Joe Davis, Walter Lindrum, and Eddie Charlton. Soon afterward, he became a fan of a new BBC series called Pot Black, featuring the new breed of snooker professionals like Steve Davis and Jimmy White. With a sense of optimism, Paul began practicing on 12-foot snooker tables for four hours a day, meticulously going through drill after drill to perfect his game, in the hope of one day becoming a professional snooker player. Then in 1983, as if called to a higher purpose, Paul put away his snooker cue and traveled east to study the ancient mystical teachings of India. It is that experience that Paul now draws on when explaining more subtle aspects of billiards, like mind management and gamesmanship. In 1995, Paul founded Food for Life Global (www.FFL.org), the world’s largest vegan food relief organization, with projects in over fifty countries. He still directs the charity from his home in New York. 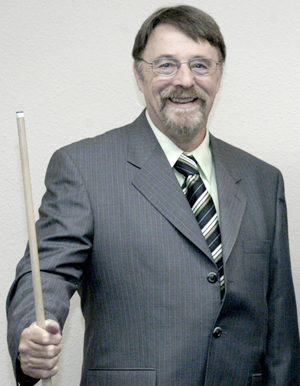 Paul did not pick up a cue again until 2001 when friends encouraged him to try out 9 ball. 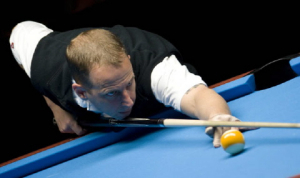 Drawing from his past snooker experience and his extensive study of the art, Paul quickly established a reputation among his peers, and soon many of them began asking for personal training. In 2006, Paul founded the Billiards Training Company to manufacture and sell his invention, the Billiard Aim Trainer, which is now being used by professional pool players, coaches, and thousands of amateur players all over the world. 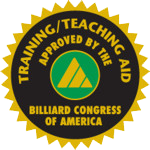 Paul continues his study of the art and science of billiards and has since been personally trained by world champions Allison Fisher and Gerda Hofstatter, as well as by top touring pro, Max Eberle, and Master BCA instructor, Jerry Briesath. How did you hear about the BAT?